The U.S. Food and Drug Administration’s (FDA) advisory committee has voted to recommend an innovative pacemaker-style gadget be approved in the United States. Created by German company Impulse Dynamics, the Optimizer Smart Implantable Pulse Generator is a medical device that’s implanted under the right clavicle, with electrodes extending into the heart wall. Unlike regular pacemakers (which regulate slow heart rates) or implantable defibrillators (which use low-energy jolts to rest irregular heart rhythms), this device uses high-energy pulses to boost failing heart muscle tissue. This technique, intended to increase the strength with which the heart muscle can contract, is referred to as cardiac contractility modulation (CCM) therapy. In essence, it boosts the performance, strength, and pumping ability of weakened heart chambers. And hopefully saves lives in the process. According to a report by IEEE Spectrum, up to one quarter of patients with heart failure considered moderate-to-severe could be candidates for the type of therapy the Optimizer Smart Implantable Pulse Generator provides. However, it would only be called into action when all the standard approaches (in this case, beta blockers and other drug treatments) have not been sufficiently successful. Despite its impressive abilities, recommending the Optimizer Smart Implantable Pulse Generator for approval doesn’t appear to have been an easy decision. Although the Circulatory Systems Device Panel voted 12 to 0 (with one abstention) that it was sufficiently safe, this was no guarantee. The device has been available in Europe for a while, but has been a long time coming to the U.S. Trials that started in 2005 and 2011 didn’t result in it immediately being cleared. But analysis from Europe has indicated that the device can reduce heart-related hospitalizations by around 75 percent. Afterward, the device can show sustained improvements in quality of life for at least two years. Ultimately, it appears that the evidence presented was sufficient to win over the FDA’s advisory committee. Of course, the advisory committee’s recommendation is only that: Advice. 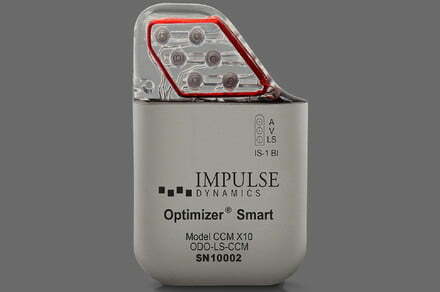 Should the FDA grant official approval for the Optimizer Smart Implantable Pulse Generator, it is likely that post-approval studies will be needed for patients. The advisory committee suggests that these last from 3 to 5 years.